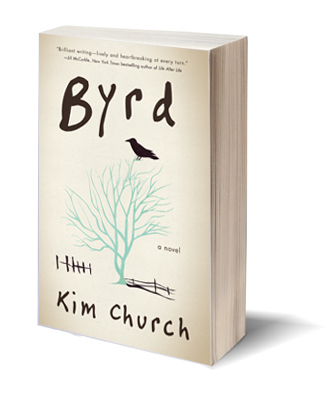 The first time I read anything about Kim Church’s debut novel Byrd was on Largehearted Boy. She put together a playlist for that blog’s Book Notes series, and I liked the playlist. While I’ve discovered many new bands through Largehearted Boy and the Book Notes series, sometimes I feel as though authors go to an awful lot of trouble to list the most obscure musical acts possible (with the exception of Leonard Cohen, Tom Waits, and Nick Cave, who all seem obligatory for about every third list…not that there’s anything wrong with that). Here were artists and songs I knew from childhood: The Allman Brothers, The Doobie Brothers, Nina Simone, Carol King. As much as I liked her playlist, I was also intrigued by her explanations of how the songs connected to her novel. When I saw it was available on NetGalley, I jumped at the chance to get a review copy. Byrd is a book about unrequited love, but also something deeper than that, because Addie Lockwood’s real unrequited love–if it can be called anything as simple as that–is her love for the son she gave up, a boy she calls Byrd, and the ideas and ideals she gave up with him. This story of a mother giving up her child for adoption is an unusual one because Addie is 32 when she decides to give up Byrd for adoption. Not to say that any story of giving up a child for adoption is typical, but Addie is at an age when a lot of married women start having children—or worrying about having children, with that proverbial biological clock tick-tocking, so her point of view is different than say, a high school or college student in the same position. I picked up Byrd late on a Friday afternoon and I finished it the next day. I haven’t read a book that quickly in years. The book begins with Addie and her not-yet love interest Roland Rhodes, the book’s central figures, in 1965 when they are in the fourth grade. Told from various characters’ third-person point of view (including Addie and Roland), we catch glimpses of them alone and with each other as their relationship evolves (and then dissolves) over the course of their lives. Although Addie and Roland’s relationship is the central relationship in the book (well, besides Addie’s “relationship” with Byrd, which is one-sided, as Addie writes letters to him over the years), we also experience Addie’s relationship with her parents and friends, and Roland’s relationship with another woman and with the son they have together. The chapters that are devoted to other characters—Addie’s mother and father, her brother Sam, and Roland’s girlfriend Elle, are some of the most poignant in the novel, and they add a depth to the characters that we would not get if the story simply alternated between Addie and Roland, or stayed with only one of them. I might as well cut to the chase. I am not much of a crier, but when I got to the end of Byrd (and maybe a few times before that), I cried. For about an hour, I cried. I wasn’t sobbing, but I continued to well up, and even now if I think about certain scenes in the novel, it brings tears to my eyes. And the beauty of it is that nothing in this novel is overworked or melodramatic. It’s the hush, the lonely hopefulness, the complexity of love and disappointment that drive the narratives of everyday life that really shine here. I highly recommend it, with 5/5 stars. Read an interview with Kim Church here. I received my copy of Byrd from NetGalley in exchange for my honest opinion. This is, by far, one of the nicest book covers I have seen in a very long time. That and the music make me want to read it without knowing anything about it! Thank you for this beautiful, moving review. I’m happy you connected with the book, and I love that you came to It through its music. Wow, this is such a glowing review. You’ve at least hooked one new reader in for this book by posting about it — just put a hold on it at the library. Cathy, the cover is as pretty as the story. I hope you can pick it up when you are in buying mode again! Kim, thank you so much for visiting! Your novel is so lovely, I am happy to do my part to help get it into the hands of readers. Jenny I hope you will love it!